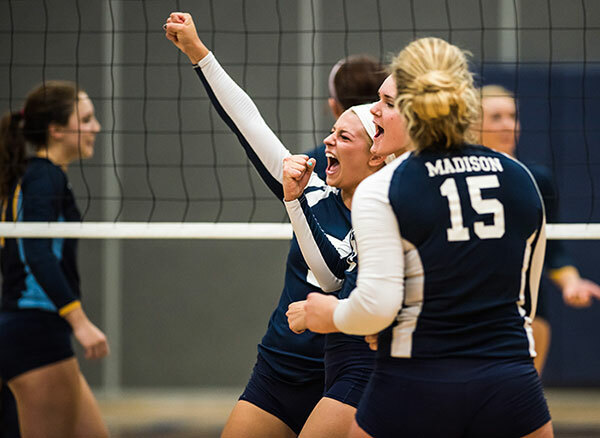 Madison College volleyball players celebrate another point against Rock Valley College on Sept. 22. The Madison College volleyball team has regained it’s No. 1 rank in the NJCAA Division III poll by winning 14-straight matches since falling to Harper College on Sept. 1. Included in that stretch was a 3-1 victory over fourth-ranked Rock Valley College, which is now tied with Madison College and Harper College for the conference lead. All three teams are 5-1 overall. The conference title will likely be decided in the next few weeks, with Madison College playing re-matches against Harper College on Sept. 29 and Rock Valley College on Oct. 20. Madison College’s next match will be at Milwaukee Area Technical College on Oct. 1 and at the College of DuPage on Oct. 6. The team returns home on Oct. 8 to play Lakeland College JV. Madison College swept UW-Whitewater JV, 3-0, on Sept. 24 to post its 14th-consecutive victory. The WolfPack started strong and overpowered the Warhawks, winning 25-14, 25-10, and 25-21. Allie Lehner led Madison College with eight kills and seven blocks. Brianne Brueggen had 23 assists and two aces. After falling in the first game to No. 4-ranked Rock Valley, Madison College rallied to win three-straight games and claim a share of the conference lead. Madison College won 23-25, 25-21, 25-18, and 25-15. TeAnn Harms had a team-high 16 kills and four blocks to lead the way for the WolfPack. Taylor Genthe added seven kills and four blocks, while Brueggen had 39 assists. Madison College won all four of its matches in the Harper College Invitational on Sept. 18-19 to claim the tournament title. The team posted 3-1 victories over Waubonsee Community College, John A. Logan College, Rochester Community and Technical College and Lake Land College. In the first match of the tournament, Madison College dominated Waubonsee, 25-5, in the first game but dropped the second game, 25-19, before winning the last two, 25-22 and 25-19. Lehner had six blocks against Harper, while Brueggen added 36 assists and Kaitlin Mooney had 14 digs. In game two, Madison College lost the first game, 25-23, before battling back to win a very close match against John Logan College, 26-24, 25-18, and 25-23. Lehner led the team with 12 kills and five blocks, while Brueggen added 43 assists. Rochester Community and Technical College proved to be a tough opponent in game three of the tournament, taking Madison College to four games before losing, 25-23, 18-25, 25-23, and 25-19. Harms led Madison College with 17 kills, while Loken added 14. Stevie Winer had 25 digs, and Brueggen added 45 assists. Madison College completed the tournament sweep by beating Lake Land College (Illinois) in four games, 25-18, 21-25, 25-10, and 25-14. Loken recorded a game-high 15 kills.